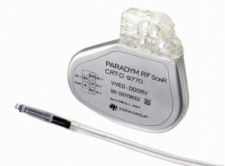 Sorin Group (Reuters Code: SORN.MI), a global medical company and a leader in the treatment of cardiovascular diseases, announced at the Venice Arrhythmias 2011 Congress, CE Mark approval and the European commercial launch of its innovative SonR CRT optimization system. The SonR system includes the SonR hemodynamic sensor embedded in the SonRtipTM atrial pacing lead and the ParadymTM RF SonR CRT-D device. SonR is the first and only system to provide weekly automatic optimization during patient’s real life activities as an alternative to in-clinic manual echocardiography-based device optimization for improved CRT response3. CRT is a therapy that delivers timely electrical pulses to the chambers of the heart. This allows the heart to beat in a more coordinated and synchronized manner, thus more effectively. Studies have shown that around one-third of patients with advanced heart failure do not effectively respond to cardiac resynchronization therapy (CRT)4,5. In order to improve therapy success rate,it is important to offer each patient a tailor-made programming of the timing between electrical impulses sent to different parts of the heart (CRT settings) on a regular basis. Current optimization methods include echocardiography and other device-based timing features. Echocardiography is difficult and time-consuming while other device-based CRT optimization features have shown limited benefits2. All of these current methods require manual steps. They are typically performed only once and only while the patient is resting. SonR is the only CRT optimization system that automatically optimizes patients every week and importantly, while the patient is active, providing real life optimization. Promising early clinical results suggest that SonR increases responder rates and reduces heart failure hospitalizations compared with standard medical practice over a 1-year follow-up6. The result of a 10-year clinical science program, the SonR sensor uniquely measures patient’s cardiac muscle vibrations. These real-time measurements are transmitted to the CRT-D device which uses them to determine the best settings for the patient. Every week, the system automatically optimizes to adapt to the patient’s changing condition. SonR measurements correspond to LVdP/dtmax, the gold standard for assessing left ventricular (LV) contractility, a key indicator of cardiac performance.